This is a really nice warm winter salad. Warm salads are under-rated, especially during a Canadian winter in the doldrums of February but maybe with more salads like this one – comforting, nutritious, colourful, tasty, and filling – they will get their due. This salad is nice on its own for lunch or a light dinner. It would also be nice as a side if you are serving other veggies, or beside non-vegan entrees for the meat-lovers (pork in particular me thinks). It takes no time to whip up and will please both the nose and the taste buds with its light middle eastern earthiness. Put the oil in a heavy skillet and heat. Add the cauliflower florets and saute until golden brown, about 8 – 10 minutes. Add the cumin and cook stirring for another minute. Add the swiss chard, onion, and garlic to the skillet and cook for another 2 – 3 minutes. Add the chickpeas and stir. Season to taste with salt. Combine the tahini, lemon juice, and pepper in a small bowl and add a little salt to taste. Whisk to combine. Transfer the vegetables to a bowl and drizzle the dressing over the top. Serve warm. 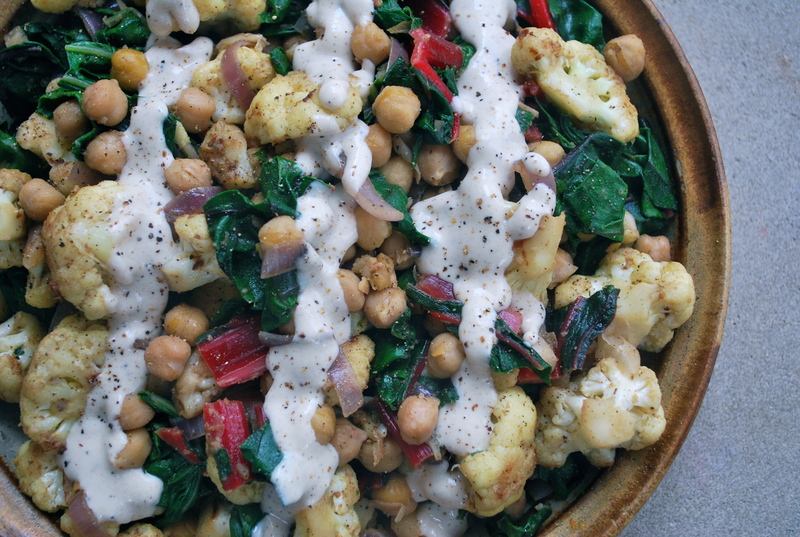 I skipped the chickpeas, as I’d already eaten them early today, and added sun-dried tomatoes. Delicious! Thanks for the idea. That sounds good. I sometimes buy smoked sun-dried tomatoes which would also be super-tasty.